Rushdoony's study tells us an important part of American history: exactly what has public education been trying to accomplish? Before the 1830s and Horace Mann, no schools in the U.S. were state supported or state controlled. They were local, parent-teacher enterprises, supported without taxes, and taking care of all children. They were remarkably high in standard and were Christian. From Mann to the present, the state has used education to socialize the child. The school's basic purpose, according to its own philosophers, is not education in the traditional sense of the 3 R's. Instead, it is to promote "democracy" and "equality," not in their legal or civic sense, but in terms of the engineering of a socialized citizenry. Public education became the means of creating a social order of the educators design. Such men saw themselves and the school in messianic terms. 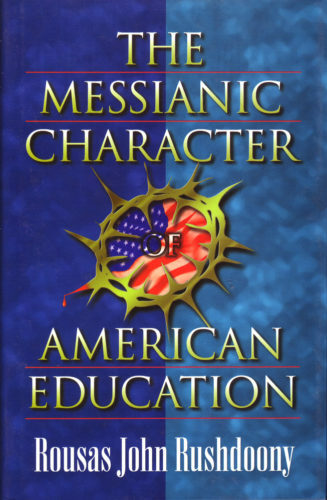 This book was instrumental in launching the Christian school and homeschool movements.